Dogs are classified in the Mammal Family under the order "carnivora" – or more simply meat eating. For those that want a diet more closely related to what a dog would eat in the wild with the convenience of a dry kibble, Pyramid Pet Products has developed Tuscan Natural Carne Grain Free Recipe. This high protein diet uses Healthy Turkey and Tasty Chicken while removing the grains commonly found in other diets. Fruits and Vegetables such as Apples, Tomatoes, Carrots, and Alfalfa Sprouts are added while Cottage Cheese provides a healthy addition from the Dairy step in the food pyramid. Of course all Tuscan Natural Recipes include our Nutrient Rich Extra Virgin Olive Oil. Prebiotics and Probiotics assist in the healthy utilization of all of these vital ingredients. 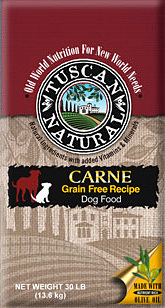 Tuscan Natural Carne Grain Free Recipe – for the carnivora in your family.